Might, and then replace the HD with a SSD. Hesitant only because RAM max is 4GB. (8GB is the minimum RAM I would want). When I had the computer up, the P.O.S.T. said the 1600 was running at 1333. So it wasn't seeing it at 1600. According to Gigabyte, the 1600 can only be run in that configuration if you overclock using that motherboard. See my message prior to this one. I'd reset BIOS to factory defaults and then run Memtest. Ok, but I'm not doing any thing today. I'm bushed from trying to figure out what's going on. I think it might be the ram, though we know, all ram if higher, the motherboard will knock it down to run at the specified speed, right? This ram was in a higher spec motherboard, the one the power supply took out. It was a gaming board which recommended the 1600MHz memory. But isn't the memory they list on the Gigabyte site, just memory they've tested, and not the memory you can use safely in a motherboard? I've read that some where on VDR some time ago. Since I still can't log in over there, I can't search that little ditty. Yes, Gigabyte's QVL is what they have actually tested. It wasn't me who started the thread. I know I can search even if I can't log on, I should have thought of that before. I'll start the tear down tomorrow, or later tonight because I took an afternoon nap, I won't be going to bed early tonight. Question about UBCD. Can I create one on a USB flash drive? I have the cd version but was hoping to be able to make one on a flash drive so not to have to cart a dvd drive to the place I'm setting up the motherboard to test the memory. I read on UBCD website about memory sticks but got lost trying to read what it said. I thought it would be simply just put the .ISO on the flash drive. Does it not work the same as on a cd/dvd? After all that reading and steps, I think it would be just as easy to tote a DVD drive out there and hook it up. I just bought a new 64GB Sandisk flash drive that comes formatted. 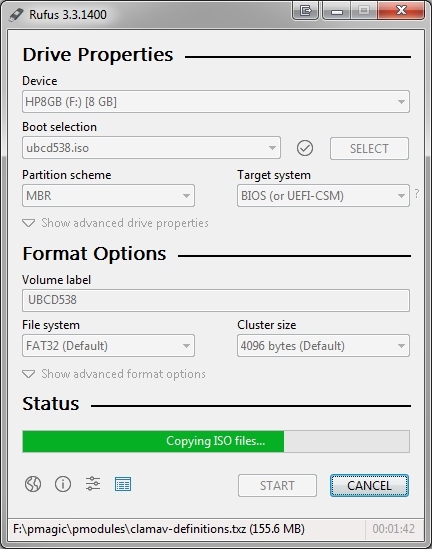 I can't see having to go through formatting and partitioning a bare drive. That's like going around my elbow to get to my thumb. arrg!! My PSU is modular, so I only need one cable to power up the dvd drive. 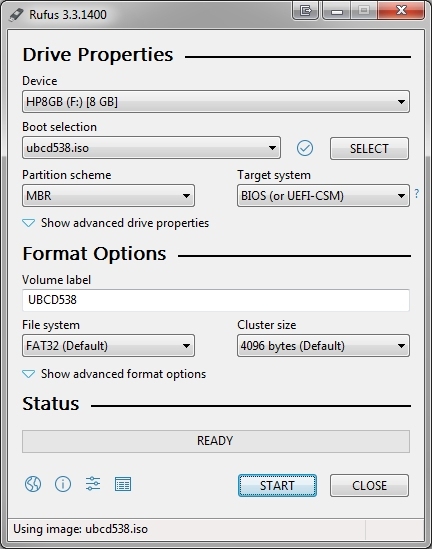 Is it formatted as a FAT32 partition? If so, simply skip over that part. Just tried it. Burned ucbd538.iso to a little HP 8GB flash drive. Here the 3 screenshots, Start, Middle, Done. Booted from it and started the Memtest86+ with nary a problem. There was another thing about this board, every time P.O.S.T loads it updates the BIOS. I don't know why it updates it each time, shouldn't it only do that once? That was awesome Doc. Thanks. Easy peasy. 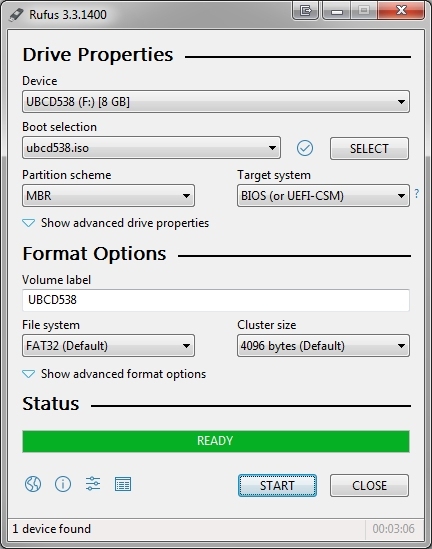 Bootable drive made, now to set it all up tonight and start the testing. Oh, and I used a pencil eraser to clean the contacts on the memory, and a fine brush to remove the debris after cleaning. You would think. Is it actually connecting the internet to do the update? You're more than welcome. Sounds like you're good to go. So, I'm thinking to wait until the first when I get paid and buy a smallish 19" to test that thing with, it's not going anywhere, and I've only got two weeks to go til pay day. I can pick up a smaller monitor for about $70-90 and I always seem to need one anyway. Fact is, I had one, a Compaq that belonged to my older brother but it only had VGA port, which wouldn't be much help now because my video cards here only have DVI or HDMI. Course the onboard, I think has a VGA port. Haven't looked that far into it. I'm going to test the board using the onboard video first, then use one of the two video cards I have, cause I don't think it's the video card that is the problem to start with. Not when I got the message with even the onboard when I connected it up to the monitor.